This week’s massive news is that I finally succumbed and upgraded to an iPhone 4s. I know the iPhone 5 is on the horizon and it’ll probably have interchangeable lenses, hover mode and a function for printing money, but I don’t need those things. However, anyone who thinks I’m behind the times in mobile phonery should consider I got my first mobile in 1990, a barely-pocketable Phillips for which I paid about £500 up-front just so I could make calls at a cost per minute that would make a lawyer envious. I made very few outgoing calls. You wouldn’t believe the similarities between the iPhone and the Phillips of yore. Both mess up the shape of your smoking jacket when carried in the pocket, and both have a battery life shorter than Jimmie Krankie’s inside leg measurement, but among the thrilling features not found on the Phillips is the camera. People rave about the iPhone 4s camera and the various apps you can use with it, the most popular being Instagram. With a few friends already using Instagram I had to give it a go and early indications are I will have to watch my step or become hopelessly addicted to photographing flakey old doors, kittens, funny signs and the sun as it shines through translucent leaves, cobwebs and dandelion heads. I think it’s fair to say though that Instagram is more about the filters and effects than about the content of the images. You can take a photo that previously would have been fit for the bin and make it quirky and interesting by fiddling around with it, adding a vignette and a sepia cast or whatever you fancy. Is it still photography? Well, yes I suppose it is. It might not be photojournalism. Much of the time it might not even result in an interesting photo, but if photography is about looking at the world in a different way, Instagram seems to be about looking at photography in a different way. I’m not a huge fan of the billions of images uploaded to the web every second of every day, but it’s not a tsunami that will stop any time soon, and I’m now responsible for a small share of that. Is it art? Who cares? What iPhonography (yuckword) and apps like Instagram allow me to do though is step outside of being a professional photographer and explore a less serious side. If I wield an SLR people expect me to take great pictures of whatever I’m looking at. With an iPhone I can join the party and use photography as a bit of fun and no one will expect me to produce stunning art. Either that, or they’ll see my Instagram efforts and think it represents my professional work. Now that I think about it some more, I wonder if that Phillips still works? It might just save my reputation. 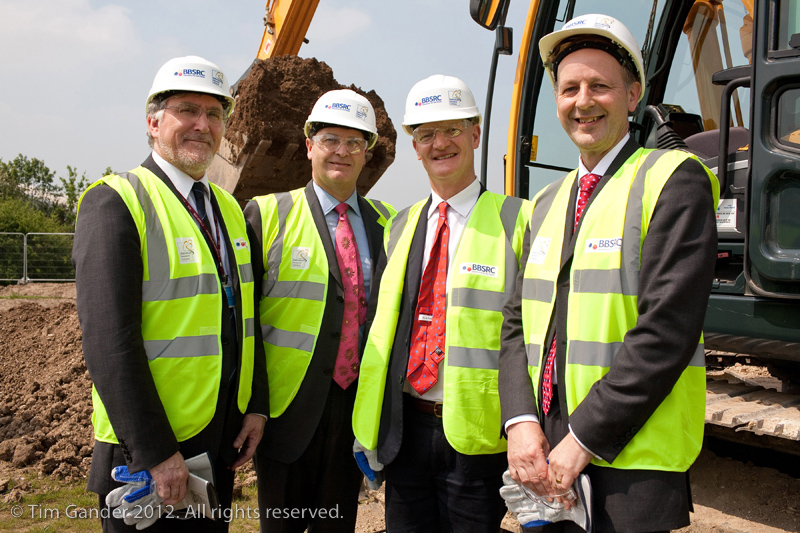 Press photography coverage for a ministerial visit isn’t always going to produce a prize-winning image, but I like to make sure I manage to get at least a couple of off-beat images for the client even if the subject is on the dry side of arid. 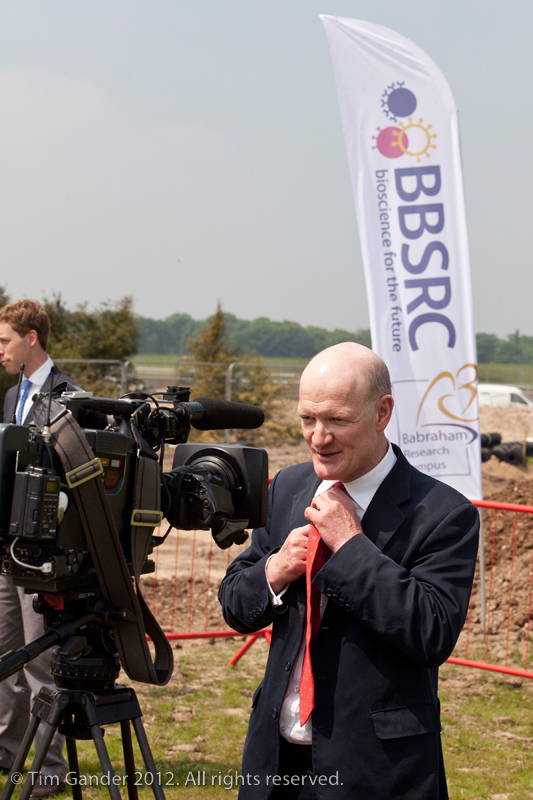 Politicians are very aware of the camera now, which can lead to rather staid situations being presented. 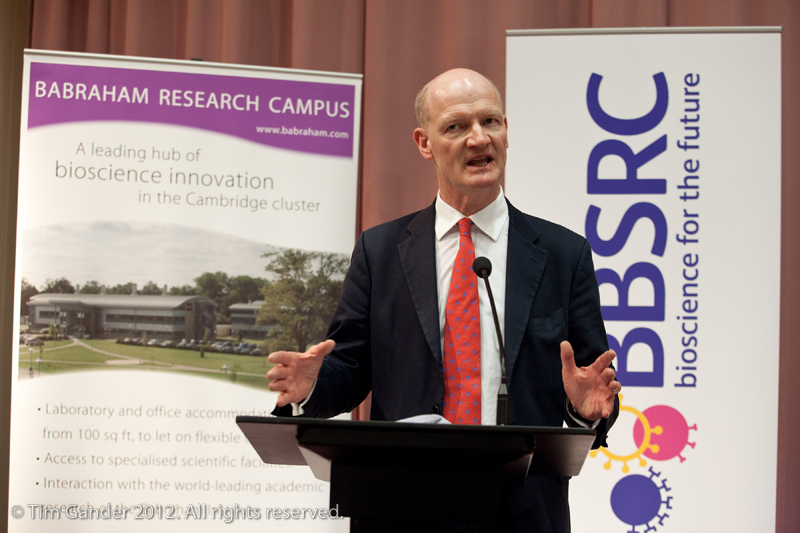 Even so, when I covered the visit of David Willetts MP to the Babraham Institute near Oxford, I achieved some decent frames. 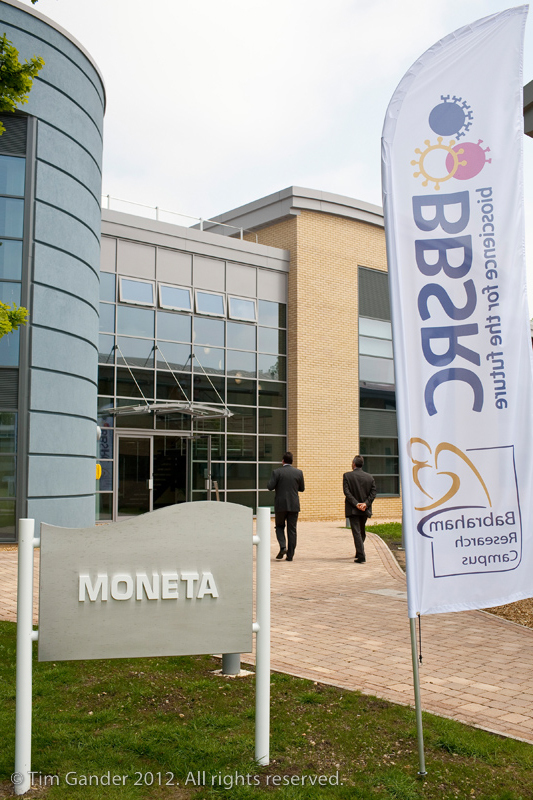 Certainly the client, BBSRC, were happy. I thought for this week’s article I’d use this event to give you some idea of what’s involved in this kind of event and the kinds of shots to expect. It’s often worth grabbing a general view or two for reference. If I’m at a conference, for example, I’ll try to get a shot of the empty stage so the client has a record of the layout and design. This is a simple view of the recently-finished building the minister was officially opening. 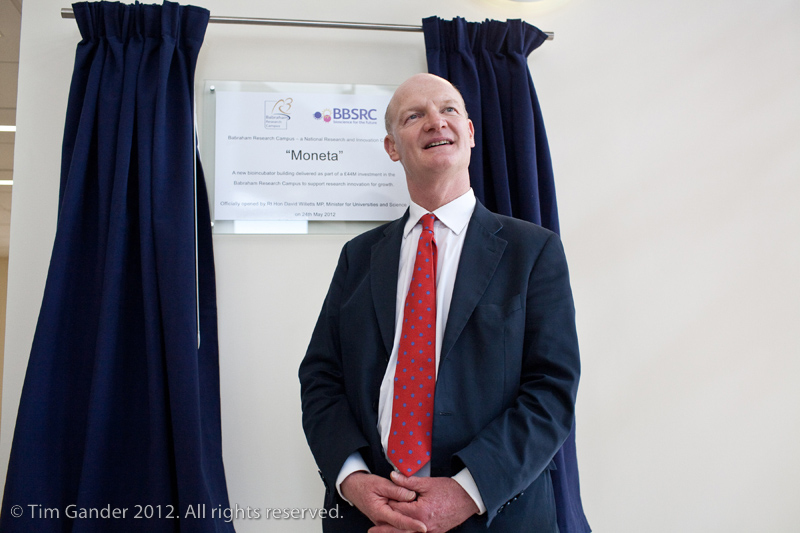 Plaque-unveiling barely counts as a photo opportunity. Even pulling other elements into the frame barely elevates the scenario, but you have to cover everything in case the curtain pole falls down or someone’s forgotten to put the plaque up! Boys and their toys… People and large machines don’t always make a nice, tight press shot. 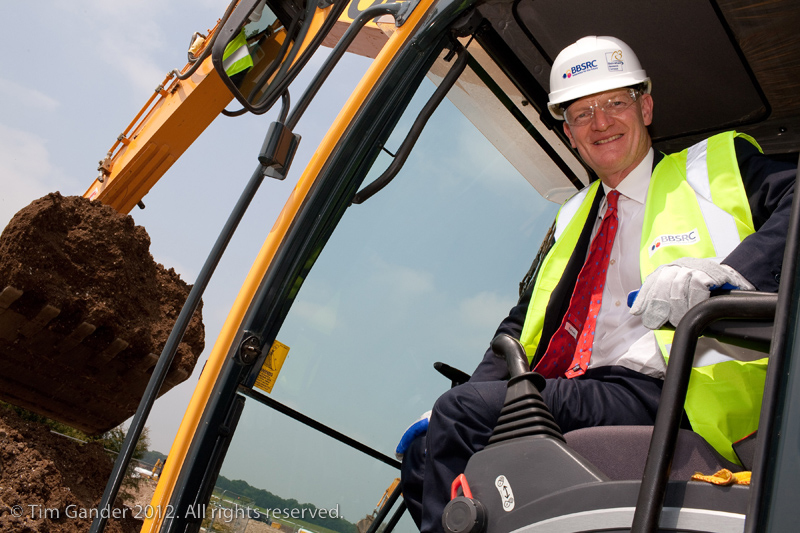 The best images of Mr Willetts cutting the first sod on a new project cut out most of the digger itself. You don’t need the entire machine to see what he’s doing. The ubiquitous group shot. What can I say? Except that not all photographers are capable of arranging a decent group photo, and some will balk at taking command of people they may feel they should show more deference to. Personally, I find the only way yo get the job done properly and quickly is to be a little bossy, but always polite. An old trick, where there’s no mirror handy, is to use the reflection of the TV camera lens to make adjustments to dress before interview. As a still image it just provides more flavour to the coverage. The client will never object to having their name in the photo. This kind of shot is probably of less interest to external press, but often works for the website and internal communications. Once the speeches are done, the minister is back in the car and off to the next meeting. No pictures, but I do stay close in case a final opportunity presents itself. After the minister departed, it was time to get the pictures turned around quickly for the client so they could be sent out with the press release. Another press job done, another satisfied customer. Do you remember summers? I do, though I have to think back a bit. I was thinking about this year’s weather and how it affects my work. My conclusion was that it doesn’t affect it as much as it used to, especially when I was shooting holiday park brochures for the likes of Hoseasons and Great British Holiday Parks. It was always a bit of a struggle to time the shoots on lodge and caravan parks because I would have to organise the dates with the parks I was visiting, then spend a few days at a stretch traveling from one park to another, allowing about a day at each one, taking pictures for each park’s brochure page. 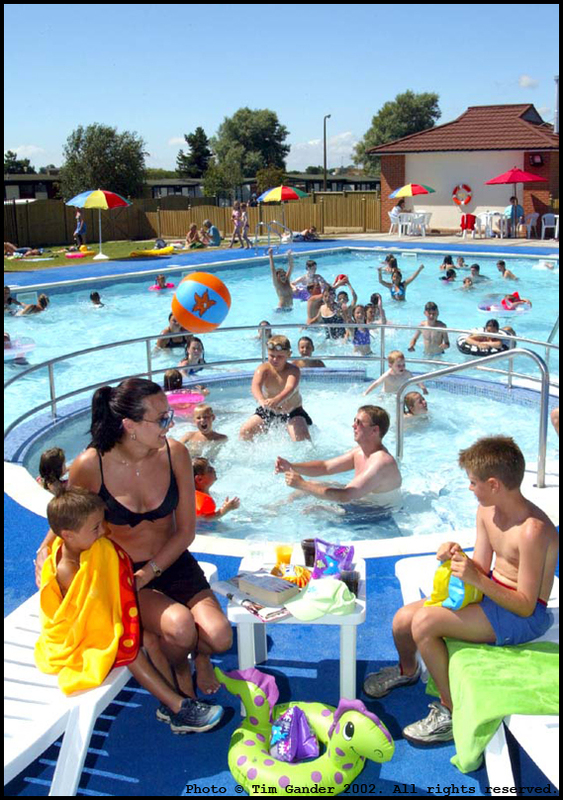 The brief tended to include getting a hero shot of the pool, a selection of caravan interiors and exteriors, the entertainments (daytime and evening), general views of the park and surrounding areas. Mostly these shots required people/models that I would have to find on the park and persuade to be in the shots. Apart from the interior shots, everything else required a certain amount of sunshine, and I wasn’t always lucky. 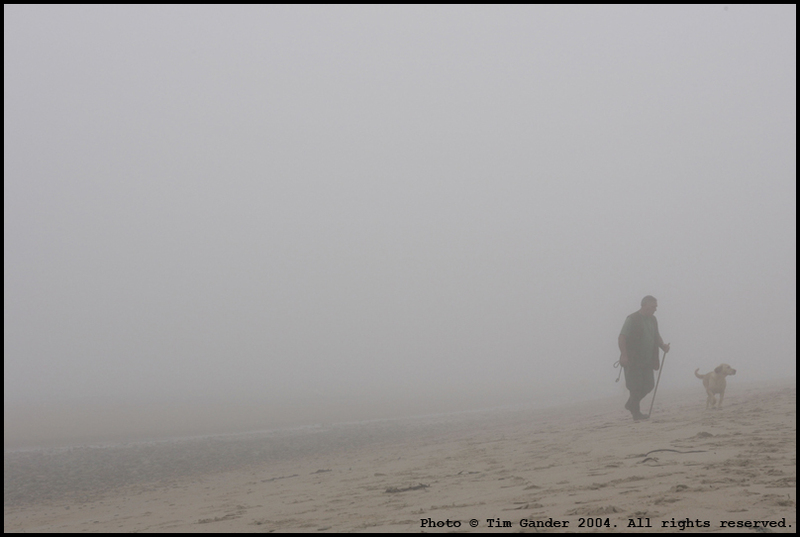 One particularly memorable year I found myself in Whitley Bay, rained and fogged in for two days. Having shot all the interiors I possibly could, I waited and waited, but the weather was showing no signs of improving to the point that I gave up and drove home. The work itself wasn’t entirely without its joys, meeting lovely people and having a bit of a laugh along the way, but it was undeniably long, hard days and when the weather broke down, it could be dispiriting. Often the shoots were timed around May before the holiday season started, so if it wasn’t decent weather it could be quite chilly and not many people around to model for the shots. 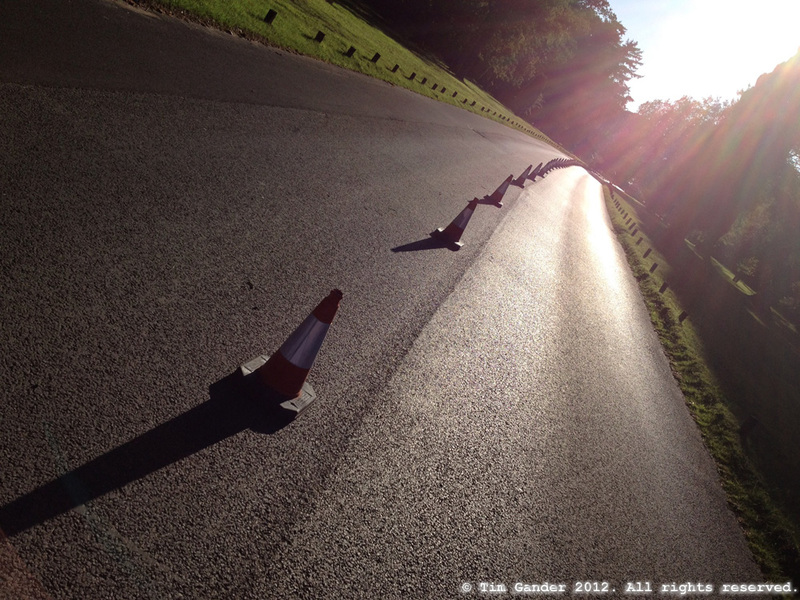 If I’d had to shoot parks the last couple of years I think I would have gone slowly insane. Apart from the wasted effort of organising and traveling to parks, once you’ve committed the best part of a week to shooting on location you can’t book in other work. If the weather then wipes out the park work, you’re left with not much more than a couple of wet-weather payments, which don’t add up to a hill of beans. In addition to all that, there’s the deadline to contend with. A designer would need the images by about the end of June at the latest in order to get the brochure designed and to the printers ready to go out just before Christmas. Some parks would just get skipped altogether if the weather meant that time ran out. No, I don’t miss shooting parks too much. It was nice work, and it got me out and about. I’ve covered parks from the Isle of Wight to Wales, Dorset to Kent and Essex and both East and West coasts of Scotland, but I’ve since replaced the work with other things, and if the last few years are anything to go by, I’m probably better off for it.